Rava ladoo with sugar syrup recipe - Rava ladoo with sugar syrup recipe with step by step photos - Rava coconut ladoo is a popular Indian sweet prepared with semolina, coconut and sugar syrup. This is one of my favorite ladoos which I love to make often. 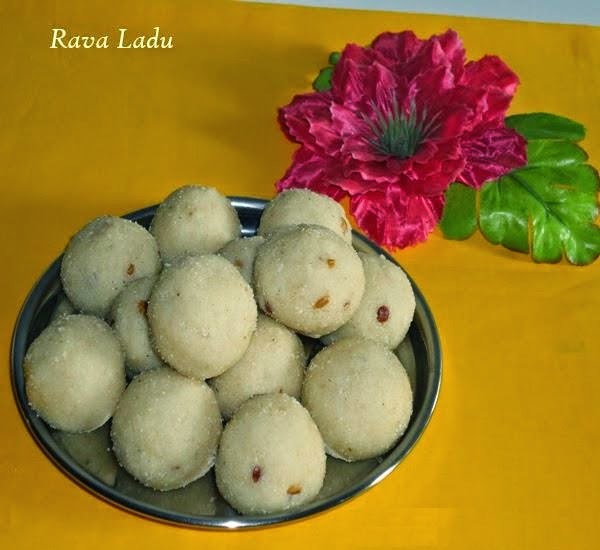 Rava ladoo is a tasty sweet ball which is easy to prepare. 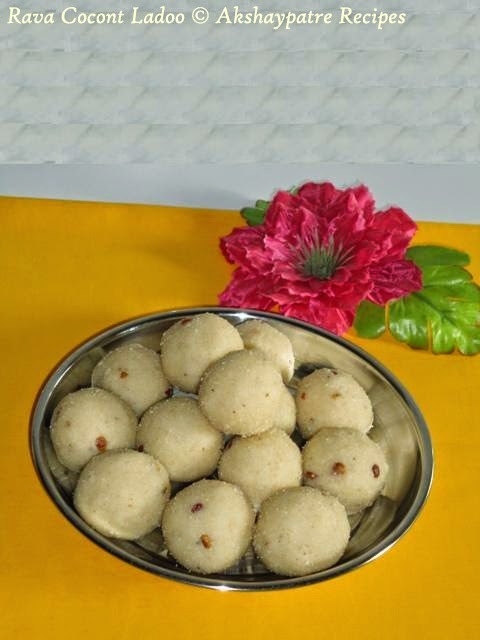 This ladoo is usually made during the festival like Ganesh Chaturthi, Deepavali and other special occasions such as birthday party, pot luck party and get together party. There are two ways to make rava ladoos. This one is prepared using sugar syrup and another method is ghee roasted rava is mixed with sugar powder and ladoo is prepared. Rava and coconut is an awesome combination and coconut not only enriches the taste but also enhances the flavor. The texture of the ladoo depends upon the sugar syrup and the level of frying rava. 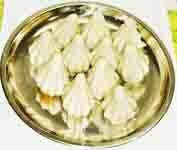 Rava should not be raw as it spoils the taste. If it is difficult to bind the ladoos, you can use some melted ghee to soften the mixture. Do not use excessive ghee. Rava ladoo using sugar syrup method is very easy once you prepare the syrup with exact quantity of ingredients and follow the steps properly. When the rava absorbs the syrup, it is easy to bind the ladoos. In a heavy bottomed vessel, add sugar and 3/4 cup of water and stir well till the sugar dissolves. Place this vessel over a medium flame. Stir continuously and bring it to a boil. Once it boils, reduce the flame and simmer for a minute. Remove from the flame and keep it aside. Heat ghee in a large pan and add rava to it. Roast the rava, till it becomes light golden brown. Add grated fresh coconut to it and roast nicely for 5-6 minute.Add charoli and roast for another 2-3 minutes. Remove from the flame. Add this rava coconut mixture to the sugar syrup. Add cardamom powder and mix well. Keep the vessel aside for about 2-3 hours. After 2-3 hours, the rava mixture. becomes little bit hard. Now transfer this rava coconut mixture to a large plate. Mix well and knead it with your hand for 2 minutes. Now make evenly shaped round ladoos from it. Do not sprinkle water or milk. Store the rava coconut ladoo in an airtight container. 1. Heat ghee in a large pan and add rava to it. Roast the rava, till it becomes light golden brown. 2. Add grated fresh coconut to it and roast nicely for 5-6 minute.Add charoli and roast for another 2-3 minutes. 4. Mix well with a spoon and keep it aside for 3 -4 hours. The rava mixture becomes hard. 5. Transfer it to a large plate. Mix well and knead with your hand for 2 -3 minutes. Now make evenly shaped ladoos from it. 6. Store the rava coconut ladoo in an airtight container.